Find out why Bonsai Outlet is America's favourite online Bonsai Shop! Here we present our own hand-picked selection of trees that are perfect for beginners. They’re easy to grow, hard to kill, and offer plenty of options for training and pruning. These “starter” bonsai are an excellent way for anyone to enter into the world of bonsai trees. They also make wonderful gifts. Young or old, anyone can learn to care for a bonsai and train it into a wonderful living work of art. Want to subscribe to our newsletter? Click here! Browse our entire collection of trees here! To begin caring for a bonsai tree, all you need is a pot, some soil, and a lot of love. However, to help your bonsai tree live a full life, while training it into the shape you want, you’ll need extra supplies. Here, we put together kits of the most-needed and most popular tools and accessories that will help your bonsai tree live a long and happy life. They also make great gifts for bonsai lovers of all skill levels! Get all the latest bonsai news by subscribing to Our newsletter! Bonsai is the art of recreating nature in miniature, creating living works of art which can survive anywhere indoors. Here we collect our favorite indoor bonsai tree species, ones which require little or no direct sunlight. We offer options for both bonsai beginners and bonsai pros. There are many different trees, with many different looks, but you’ll see trees which can make any room look more stately while bringing you years of enjoyment. Keep up on important BonsaiOutlet news by subscribing to our newsletter! Prefer to see all our trees at once? Click here to browse the full catalog. Some bonsai trees prefer the outdoors, and can make amazing additions to your front yard, back yard, or even an outdoor patio. You’re guaranteed to get plenty of attention with a noble, well-trained bonsai tree in your yard. They can enhance your curb appeal, and be the talk of any yard parties you host. Be aware, these trees will be more sensitive to weather and climate than indoor bonsai, and may require a greater level of care and attention. Click here to subscribe to our newsletter, filled with great bonsai tips! Browse our complete catalog by Clicking here. 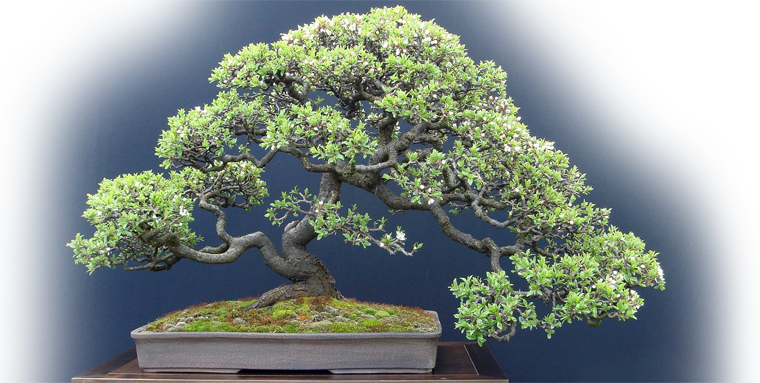 Not every bonsai tree species will bloom… but when they do, it’s genuinely magical. We’ve carefully selected the most impressive flowering bonsai trees in our collection, and every one will put on a colorful show for you most years. Occasionally, they may even provide edible nuts, berries, or flowers! You’re truly getting something special when you choose a flowering bonsai, a true centerpiece of your home which will always wow your visitors. Are you subscribed to our newsletter? If not, Click here! Prefer to see all our trees at once? Browse the catalog. Adopt A Living Work Of Art! BonsaiOutlet has a limited number of specimen trees, hand-raised for twenty years or more by reputable bonsai nurseries, now under the care of our own Bonsai Master Jun Imabayashi. Our specimen trees are hardy and have been exceptionally well cared for, and will still thrive for many years to come. These unique one-of-a-kind trees are stunning works of art that will instantly enhance a home, office, or any other room. If you’re interesting in adopting a specimen tree, don’t wait. Our stock is limited! Click here to subscribe to our informative newsletter. Browse our entire collection of trees for more great bonsai options. We have a large selection of stock plants / Pre-Bonsai. Each hand-selected by Bonsai Master Jun Imabayashi. Each bonsai tree is individually hand-made and take hours to complete. Find out why Bonsai Outlet is America’s favorite online Bonsai Shop! While other Bonsai Shops cut quality to lower costs, we refuse to shortchange our customers. We believe, as you do, that when you shop for a Bonsai Tree or supplies, that you are shopping for quality products that will stand the test of time. BonsaiOutlet has the benefit of an expertly tended nursery thriving with healthy Bonsai Trees. We stand behind every Bonsai tree we sell and customer satisfation on unconditionally guaranteed.